The Deal Redwood Shiplap tongue and groove Traditional Pent Tool Store Shed collection is one of the highest quality you will find. If you’re searching for a strong, solid secure place to keep all of your expensive power tools and equipment then this is an excellent choice. It doesn’t just feature a strong tongue and groove exterior, it also comes with the same quality interior. 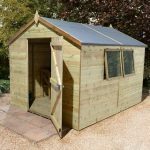 Both the floor and the roof are built from tongue and groove cladding, making it one of the most weather-resistant, durable tool sheds on the market. There are no windows on this shed so privacy will never be an issue. It also comes with a strong key operated lock, making it very difficult for thieves to break in. What we truly like about this range of sheds is the fact you can customise the door. Available in a single or double door design, it really sets the shed apart from any of its competition. Dip treated at the factory, the shed can be left untreated up to 6 weeks after assembly. There are many sizes available and this is one of the deepest, offering an excellent amount of storage space. We highly recommend this model and its pent roof makes it more suitable for installation in areas where an apex roof might cause a problem. Poor quality roofing felt. However, you can buy and install a thicker, more durable felt. In the Treetops Traditional Pent Tool Store Shed collection, you’ll find a wide range of sizes available. This is one of the deeper variations, offering an outstanding depth to store all of your tools. The only potential issue with the depth of this shed is that everything cannot be as easily reached via the doorway as it can with the smaller models. 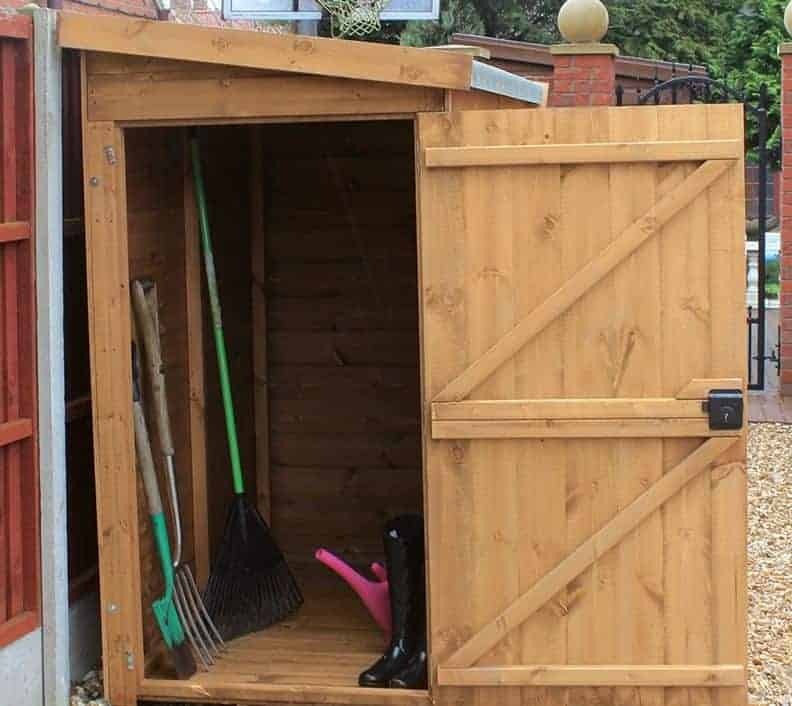 As the door is only 4’9” and the shed isn’t designed to walk around in, this can make reaching your storage more than a little inconvenient. However, storing the things you don’t need very frequently towards the rear of the building will ensure this doesn’t cause too many problems. Inside this superior quality shed you’ll find a tongue and groove roof and floor. 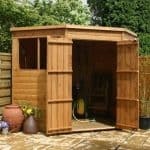 This is the strongest type of construction you will find in any outdoor wooden shed and it ensures you are provided with a very strong, long lasting and stable building. It is particularly beneficial for those looking to store pretty heavy tools. The floor will easily hold heavier tools and equipment and the fact you won’t need to upgrade it is a massive advantage. A pent roof gives you more options of where you want to erect the shed. It has a sloping design to ensure it filters rainwater away and it can be placed underneath low hanging objects. The sheds walls are built out of 12mm Shiplap tongue and groove cladding. There are various thicknesses of Shiplap available and 12mm is the one you will find on most storage sheds. It offers a very professional, attractive style and feels smooth and sturdy to the touch. Whilst it does offer a more aesthetically pleasing look, it is the strength, longevity and security benefits that really set it apart. This style of cladding provides a superior level of weatherproof benefits compared to cheaper overlap cladding. For example, there is a natural built in channel which stops any rainfall collecting on the timber. As the walls are also formed with an interlocking tongue and groove design, they are also better protected against drafts from even the strongest winds. The structure of the shed is held together by a thicker than average 44mm x 27mm frame. Like all others in this range, the 9×3 tool shed has been dip treated by the manufacturer. This involves dipping the timber into a high quality preservative where a protective waterproof coating is absorbed onto the surface. It is then left to dry before it is shipped out. This treatment doesn’t eliminate the need for annual treatments, but it does provide more protection than a simple basecoat. The Shed Store recommend re-applying a treatment within 6 weeks and then every year afterwards to maintain the cladding’s excellent weatherproof benefits. The pent tool store shed range are windowless with a number of customisable door options. This is one of the larger depth models, but its width is a little shorter. This means you are not given the option to choose double doors like you can with the slightly wider variations. However, you still have the option to keep the single door right where it is in the photo or it can be moved to the opposite gable. The door itself features thick bracing and you can tell just from looking at it that it has been designed to an exceptional standard. 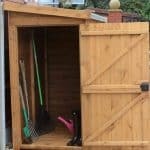 The one thing you can be sure of when choosing this shed is security. It comes with one of the highest security constructions of any tool shed thanks to the excellent key operated lock. This isn’t going to be easy to break into and is harder to pick than a padlock. The thick 12mm cladding also gives it more secure build. Obviously with no windows privacy is also never going to be a worry. All in all this is one of the most secure and private tool sheds on the market. It’s possible to change the position of the door from how it is shown in the picture to the opposite gable. 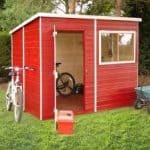 There are many different size variations of this shed and most also give you the option to add double doors too. Whilst the description clearly states you can do that with this one, there is no option under the customisation options and extras on the product page. So you will need to contact the manufacturer to check whether the double doors are available for this particular shed. Floor bearers are the most useful extra on offer. When you look at the shed in the picture, you’ll notice it comes with floor bearers attached. This isn’t how the shed is sold as standard and you will need to buy the bearers separately. They help by lifting the floor of the shed off the ground, thus protecting it from any problems caused by damp. It ventilates the floor and helps to keep your storage safe and dry. There is a Garden Building installation service available too. This is a little on the costly side and it is basically there to ensure you benefit from a stress free build. However, we really would advise saving your money as this model really isn’t that difficult to assemble. 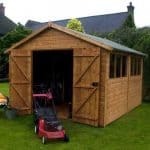 You won’t find a better quality tool shed than this fantastic model. The Redwood tongue and groove Shiplap cladding is extraordinary and really gives it a stylish, flawless finish. The annual treatments required to maintain the sheds natural weather resistance is the only thing that stop us giving this building a 10/10 for longevity. The materials are extremely durable and the shed is guaranteed to last for many years to come. Being one of the larger models in the collection, this can fit a lot of tools and equipment. You won’t be able to store anything particularly wide, but if you simply have lots of small bits and bobs then this is a fantastic place to keep them. One of the things customers really like about this shed is the fact it is so easy to put together. As mentioned, you can pay for the professional installation service but you should find it easy enough to put together yourself. With no major upgrades required and fantastic security, this tool shed offers extraordinary value for money. Final Thoughts: There isn’t a more durable, safer tool shed than this great model offered in the Treetops Traditional range. Every small detail of the building is created to an outstanding standard. It is one of the biggest in the range and therefore gives you a generous amount of storage space. As the floor benefits from the same thick tongue and groove as the walls, it makes it the ideal place to store heavyweight tools. 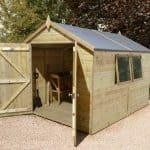 With fantastic weather resistance, a key operated lock, dip treated walls and a superb windowless design, this is one of the best tools sheds we’ve reviewed by far.